Microsoft’s SMS Organizer is one of the most popular and feature-rich messaging apps on Android, a boon for users who receive a ton of spam or promotion messages. 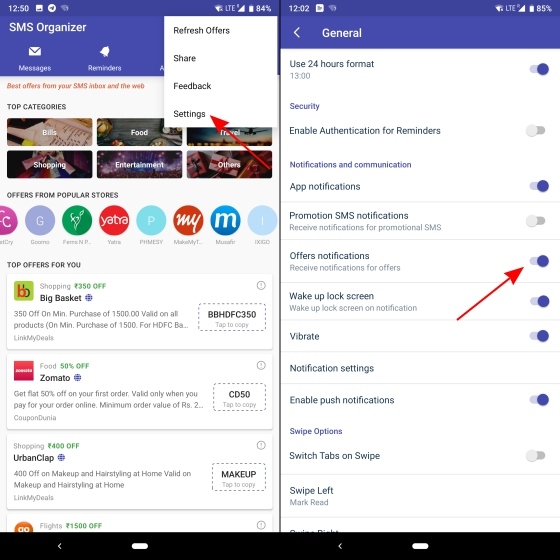 While it has helped hundreds of thousands of users stay distraction-free by hiding unimportant messages, the app is now telling you offers and discount coupons after its latest beta update, adding more clutter than it’s removing in the first place. SMS Organizer previously had a three-tabbed UI, including the Messages, Reminders, and Accounts tab but if you’re a beta tester for the app and have received version 1.1.112, then you would now be seeing a fourth “Offers” tab on the far right. 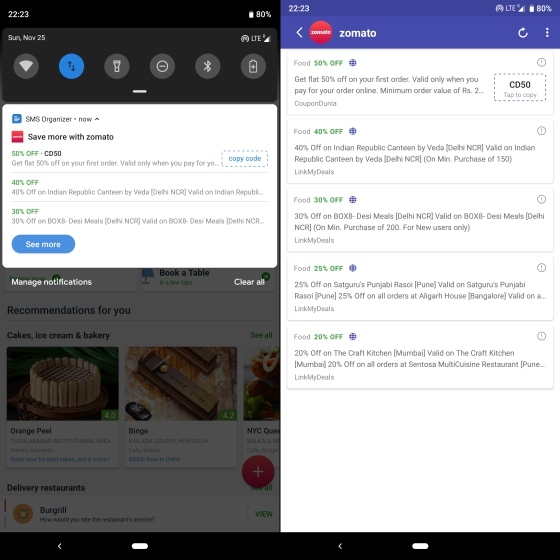 You can tap on the newly added Offers tab to view all of the available coupons, which are not just listed haphazardly but divided on the basis of categories (food, travel, shopping, and more) and platforms (Faasos, BigBasket, Zomato and more). You can tap on these offers to read the terms and conditions, as well as copy the code. 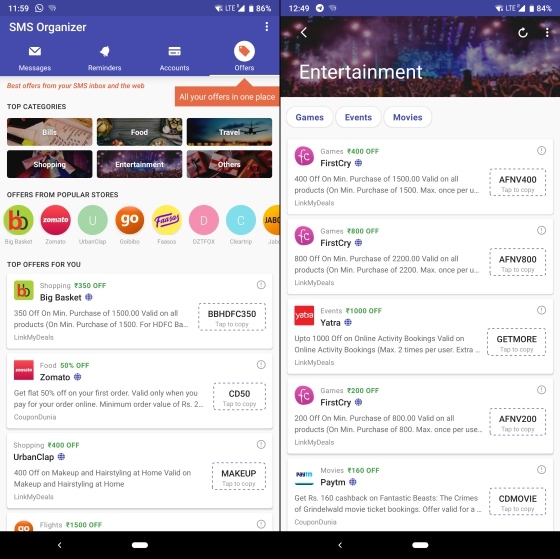 As you can see in the screenshot above, SMS Organizer is sourcing deals not only from your inbox (which is counter-productive as you’re using the app to not see them) and other popular coupon platforms like LinkMyDeals and CouponDunia. 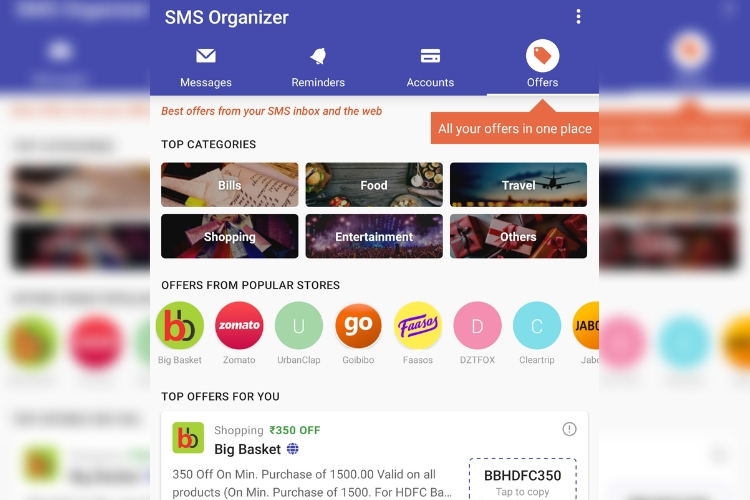 The highlight of this feature is that SMS Organizer can notify you of the best offers the moment you open an app, for which coupons are available. You can see here that when we opened Zomato to place a food order, the app surfaces coupon whose code you can copy from the notification itself. However, if you feel that SMS Organizer sending you discount coupons via notifications each time you open another app could become annoying very soon, well, Microsoft has provided an option to turn it off in the Settings. It doesn’t want you to feel like you are being spammed. You can simply tap on the ‘three dot’ icon on the top right, navigate to the ‘Settings > General’ menu from the overflow menu and toggle off the ‘Offer notifications’ option there. You won’t be disturbed by any more coupons or offers in the notifications center. This feature could come in pretty handy for some, while it will annoy the heck out of others but nonetheless Microsoft seems to have figured out a revenue stream for its most popular Android app in India.